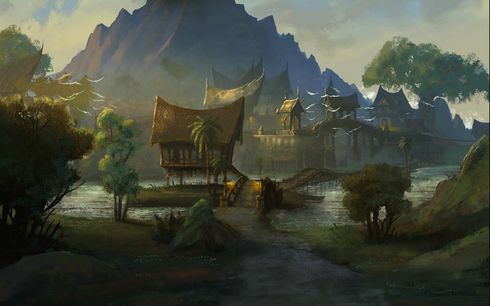 This island off the south coast of Elsweyr is named after the Khajiiti goddess of weather and the sky, who is usually represented as a great hawk. She finds many worshipers among the cat-folk's sailors and farmers, especially those who grow moon-sugar cane. Storm on the Horizon: Go to Khenarthi's Roost to find the Khajiit who saved you. Cast Adrift: Search for survivors in the Shattered Shoals. Tears of the Two Moons: Investigate restless skeletons and stop a malevolent spirit. The Tempest Unleashed: Stop a summoned storm from destroying Mistral. This page was last modified on 2 February 2019, at 19:44.